With the federal government now strongly endorsing electronic health records (EHRs), going paperless in HIM has become a more realistic goal. Enthusiasm is widespread as facilities apply to receive a portion of the nearly $20 billion allocated for EHR implementation under the American Recovery and Reinvestment Act of 2009. Although costs may be less of an issue, transitioning to an electronic system still takes time, preparation, and organization. HIM directors must be ready to face the challenges to come, specifically those associated with managing and converting the hybrid medical records that are created as paper and electronic records mix. Managing hybrid records is no easy task. The rules and regulations that govern the handling of electronic records are completely different from those of paper records. Therefore, HIM staff must comply with two separate sets of requirements to create one system. These varying regulations present issues in terms of privacy, legality, storage, and staffing. While paper records are, for the most part, safe behind lock and key, EHRs require special security and IT adaptations to comply with HIPAA and other governing regulations for safeguarding patient data. For EHRs, security measures must be put in place to prevent hackers and other unauthorized individuals from gaining access to patient records. In certain circumstances, HIPAA grants access to medical records for legal purposes. The HIM professional is considered the “custodian of the record” and must determine what constitutes their organization’s definition of a legal health record, as well as what can be disclosed and which format is required in court. HIM staff may even be called to testify in court concerning the authenticity of a patient record. • Can information be deleted from records? • Is there a tracking method in place to monitor changes to an EHR, and who is making them? • Does a backup system exist in case original documents are lost? For some facilities, having additional backup in the form of old paper records is a viable option. For others, space is too limited to store all paper records, making electronic backup vital. When converting and then destroying records, HIM managers must pay careful attention to state and federal regulations for record retention and develop policies for how long the facility will keep paper records. Transferring information from paper to electronic records requires a significant amount of resources, as paper records must be scanned one by one. This is costly in terms of time, the number of staff needed, and the loss of productivity related to current workloads. For many facilities, the hybrid system may seem attractive because staff need only convert a record when a patient seeks care. Facilities that decide to convert all records at once may find that bringing on temporary staff to help stay abreast of current needs can be beneficial. Many staffing firms can provide personnel to assist with scanning records and help staff adjust to the new system. Although converting records has its costs, EHRs offer considerable benefits to healthcare providers. EHRs can mean improved accessibility to patient information, decreased diagnosis and treatment errors, lower complication rates, and improvements in the continuity of care across health systems. Catapulting EHRs into the national spotlight has even opened doors for new providers in the healthcare arena. Giant “Main Street” retailer Wal-Mart is entering the EHR space for physician practices with an affordable alternative to the costly software packages used by larger hospital networks. Ideal for private physician practices, the software will be sold on the shelves in Wal-Mart’s Sam’s Club stores and will provide training and ongoing maintenance along with the scanning and record-charting software. • Develop an EHR implementation plan, define milestones, and set goals. • Involve staff in the design and planning of the new system. User acceptance is vital to a successful transition. • Don’t reinvent the wheel. Look to best practices, references, white papers, and implementation models. • Educate staff on policies and procedures for hybrid and electronic environments. • Prior to converting any records, clean up the master patient index to eliminate duplicate records and prevent wasted time spent converting excess records. • Be sure the computer system is equipped to handle the increase in information. Perform necessary system maintenance to reduce the risk of system failure and data loss. • Track progress and monitor compliance along the way. • Celebrate successes to keep staff morale high. Healthcare providers are in the midst of an exciting time as federal assistance for health information projects becomes available. To receive stimulus dollars, each facility must prove “meaningful use” of EHRs. As a result, HIM professionals should do their best to ensure their facilities receive their share. One tactic they can employ is to outline how EHRs will result in a decrease in errors and an increase in the quality and continuity of care. 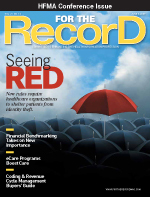 The healthcare industry is poised to make nationwide EHR implementation a reality. With the support of the government, and even big box retailers, it is becoming easier for healthcare facilities of all sizes to convert to electronic record keeping. As EHRs become increasingly mainstream, HIM professionals can take pride in being part of the solution that brings about a more efficient healthcare system. — Michelle Martin is group vice president of Kforce Healthcare Staffing, a professional staffing firm providing contract and direct hire staffing for HIM departments.